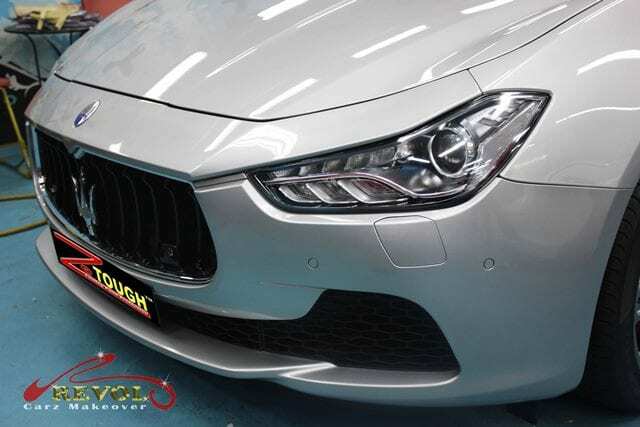 A hot Italian Maserati Ghibli S sedan was a real showstopper as she growled her presence at Revol Carz Makeover workshop – for a perfect grooming session with ZeTough Ceramic Paint Protection coating. 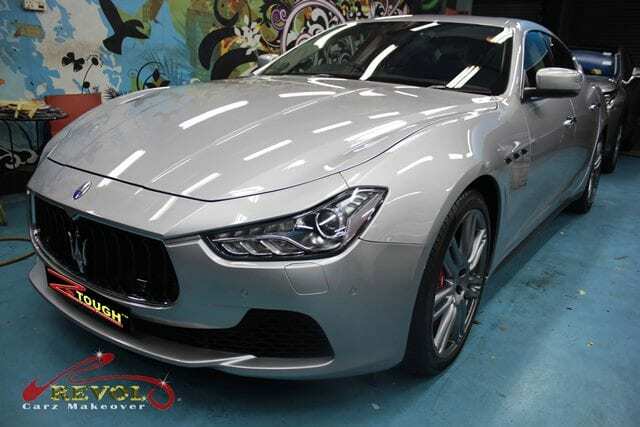 The Ghibli (say, “gib-lee) is also a name for African desert wind – and a perfect name for a hot Maserati with a supreme Italian design to inspire and exhilarate. 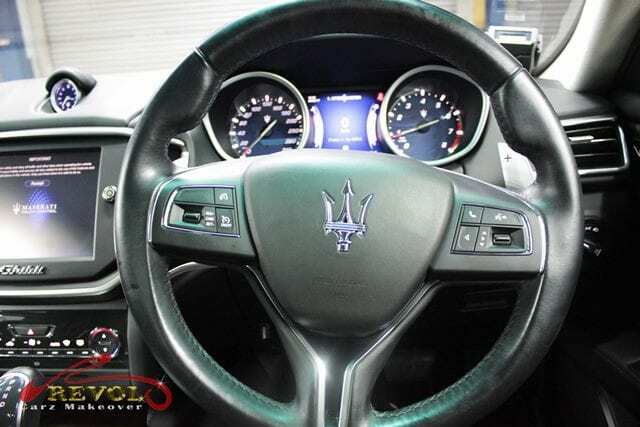 Its deliciously curved, sporty contours and long bonnet implies a powerful engine within while the front grille and classic Trident badge instantly announce it to be a Maserati. 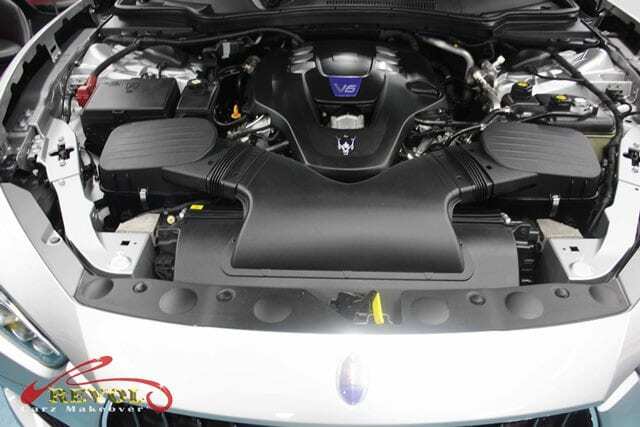 Lurking underneath the sporty hood is a 345 horsepower, twin-turbo 3.0-liter V-6 engine and rear-wheel drive mated to an eight-speed automatic transmission. The sprint from 0-100 km/h takes five seconds flat, and a 285 km/h top speed makes it faster than its rivals. Thanks to its substantial 1,810kg weight. 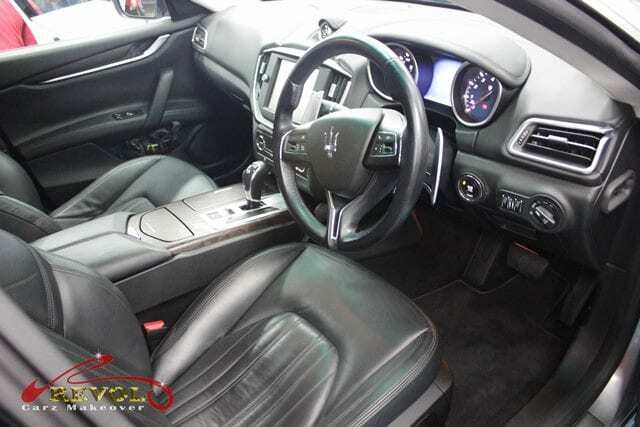 Step inside the Ghibli and you’ll find exceptional ambiance and highest quality materials for ultimate comfort. With the post Revol professional grooming and ZeTough Ceramic Paint Protection coating, the Ghibli boasts of a better-than-showroom brilliance. Its long bonnet implies a powerful engine beneath, whilst the front grille and classic Trident badge instantly announce it to be a Maserati. The power of ZeTough Ceramic Paint Protection coating enhanced the front classic appeal. The radiator grille with the converged the striking headlights are more eye-catching. The striking LED headlights are rigorously polished to achieve this crystal clear jewel. Restoring the engine compartment to an immaculately cleaned and new condition is one of our favorite highlights. This powerful 3.0-liter twin turbocharged, 345 hp V-6 petrol engine mates to an 8-speed automatic transmission. Our groomers take lots of patience in detailing the interior ensuring every inch is cleaned and sanitized. The leathers are cleaned, polished and nourished with premium conditioners. The large analog speedometer and rev-counter have elegant white back lighting and are separated by a 7” TFT display that shows the car’s dynamic data. The restored ergonomic leather-clad steering wheel is nice to hold after leather conditioning. 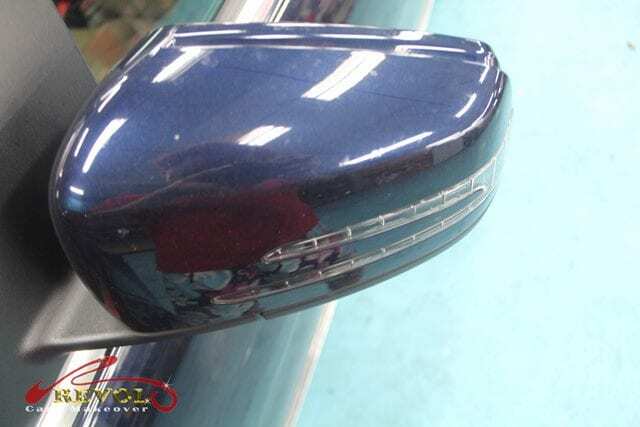 Here is a close-up shot of the wing mirror showing the hard painted surface and luster after the ZeTough Ceramic Paint Protection coating is cured. Rear view of the Maserati Ghibi after the ZeTough Ceramic Paint Protection coating. Look at the ruby-finish of the taillights after polishing. The well-polished chromed Quad Exhaust Tail Pipes. The revive-inch alloy wheels are cleaned and polished. No more brake dust and scratches. Contemplating giving your car a new lease of life? We can transform your car to a high level of perfection and better-than- showroom condition. With the added coating of our renowned ZeTough Ceramic Paint Protection, we guarantee your car’s paintwork gets maximum protection throughout your ownership. Maintenance after the coating is minimal. 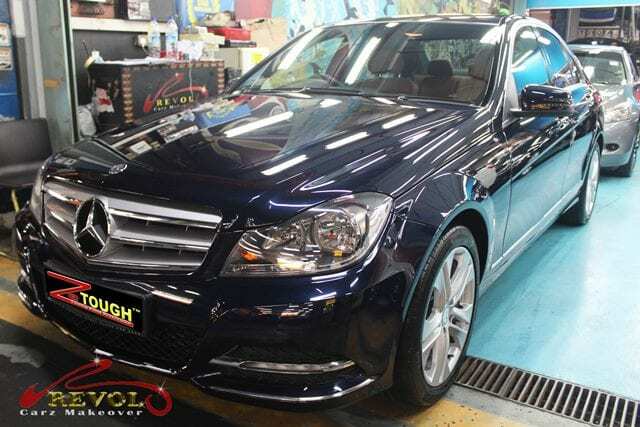 Another Blue Efficiency Mercedes Benz C180 arrived at Revol Carz Makeover for a refreshing makeover and an overall respray with faithfully matched original factory color code paintwork. For an added must-have permanent shine and protection, the surface is treated with the ultimate, ZeTough Ceramic Paint Protection coating. Blue EFFICIENCY means reducing fuel consumption and CO2 emissions, saving on costs and protecting the environment. 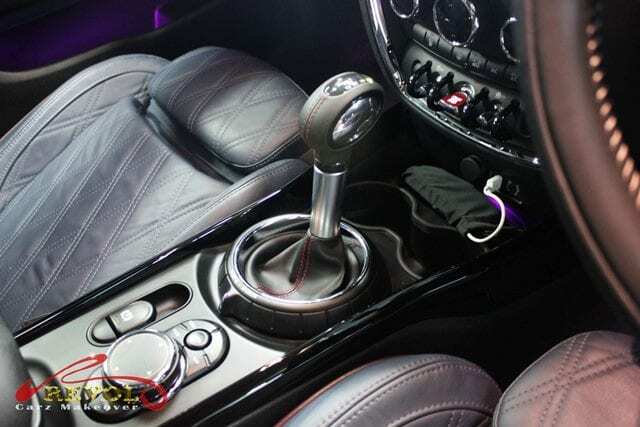 The interior is typical of Benz fashion, favoring a light and bright approach with generous stainless steel trims. 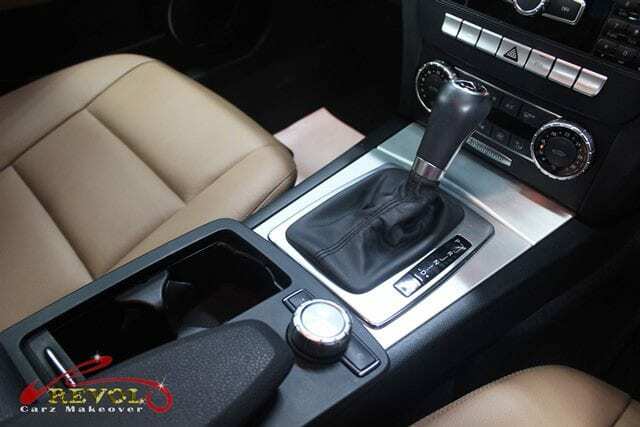 The seats are in luxurious Artico leather and the standard equipment Thermatic Climate Control, Auto Headlights, Parkig Sensors, Bluetooth connectivity and multifuncton steering wheels. Lurking under the hood is a 1597cc 4-cylinder quiet engine mated with a 7G-tronics transmission, the C180 BlueEfficiency performs a 0-100km/h dash at 9.9 seconds and a top speed of 225km/h. We are including intriguing pictures showing the magic of ZeTough Ceramic Paint Protection, for your viewing pleasure. Our professional Spray Painting standards and makeover skills transformed the C180 BlueEfficiency into an exhilarating showroom masterpiece. 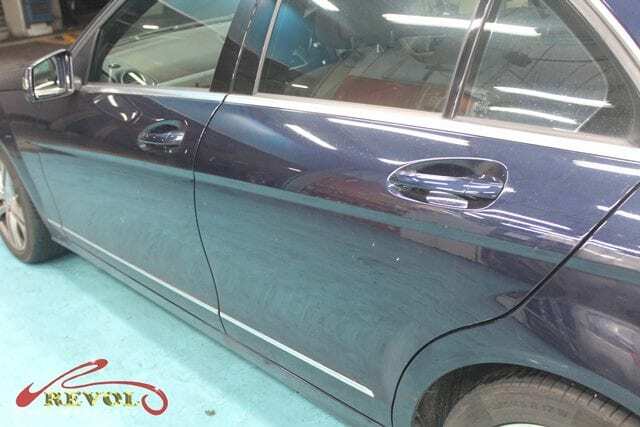 These “before” pictures show the weathered surface conditions of the Mercedes C180 without ZeTough paint protection. The inevitable scratches and dulling paintwork are resulted of prolonged exposure to harsh tropical elements and poor maintenance. BEFORE – The doors and wing mirrors will be carefully stripped for repainting works. 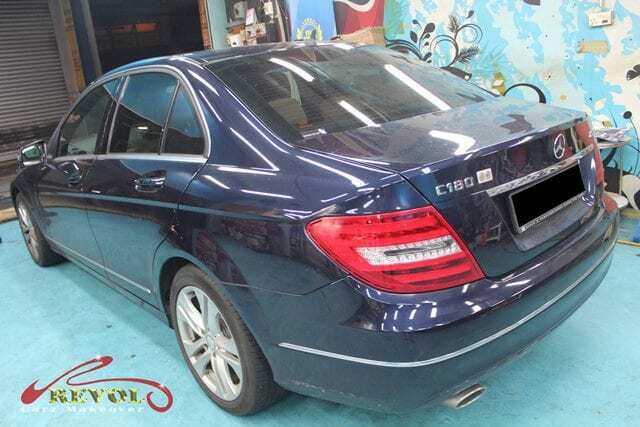 At Revol Carz Makeover, a total respray means we leave no traces of the old paint. The C180 BlueEfficiency is restored to its showroom glory at Revol Carz Makeover. 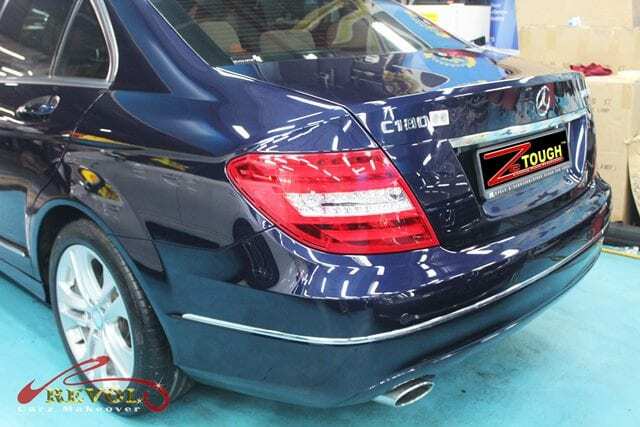 Thanks to the excellence of ZeTough Ceramic Paint Protection. The C180 will boast a lifetime of brilliant shine with minimal maintenance. 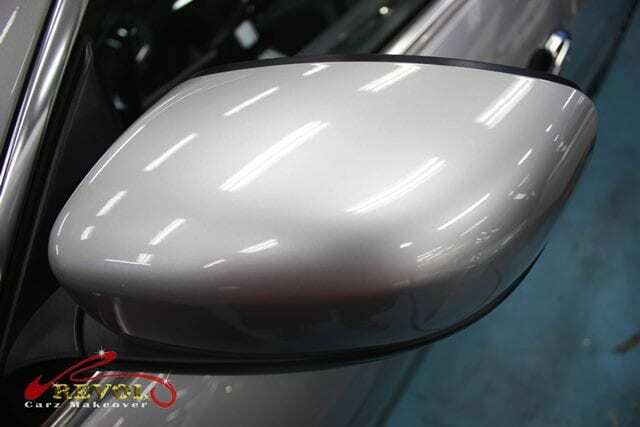 A close up view on the flawless finishing after ZeTough Ceramic Paint Protection coating! Our restorers paid a lot of attention in deep steam cleaning and polishing the engine bay to bring it back to such beautiful condition. AFTER – The interior is sanitized, steam cleaned, leather nourishing and restoring. It gives us great satisfaction in restoring the interior to a perfectly clean and new condition. The interior before the restoration. BEFORE – Before spray-painting, the wing mirror was scratched and dull. 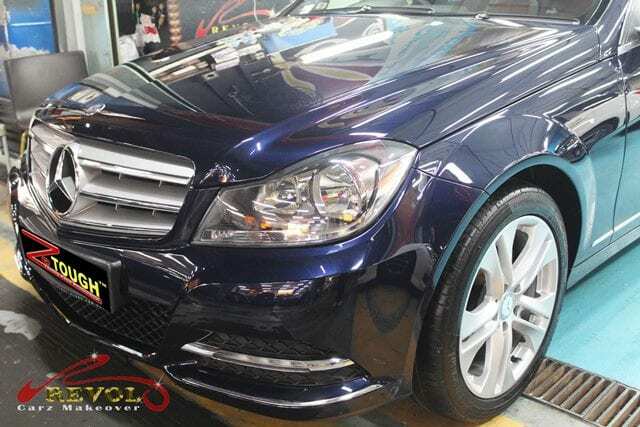 AFTER – Scrutinize the high quality finishing with ZeTough Ceramic Paint Protection. We take great pride in showing our finest Makeover works on the Mercedes C180 in achieving this stunning better-than-showroom condition. AFTER – The striking reflections of the rear exterior are projected with ZeTough Ceramic Paint Protection coating. Before – The weathered exhaust tailpipes which will be cleaned and polish to new conditions. BEFORE – The wheels covered with brake dust will be dismantled for cleaning and polishing. 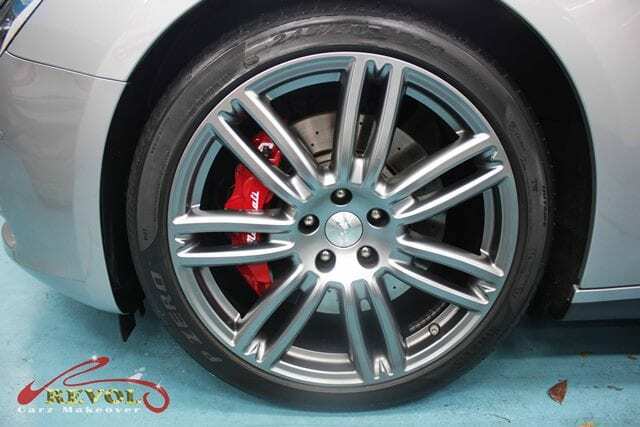 To complete the new showroom feel and condition… Rims must be restored new and shiny! 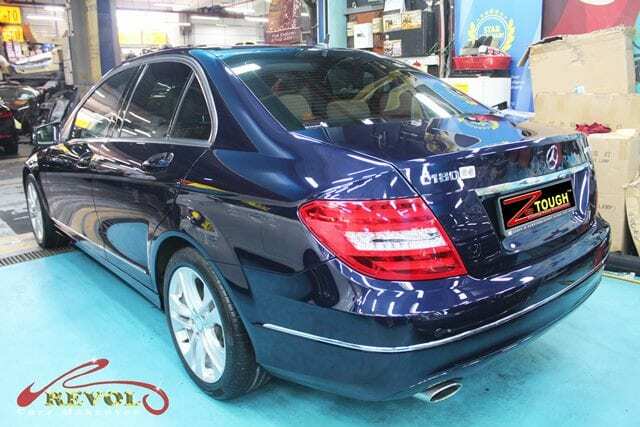 With the coating of the renowned ZeTough Ceramic Paint Protection, we guarantee your car’s paintwork gets maximum protection with better-than-showroom shine throughout your ownership. Maintenance after the coating is minimal. Contemplating giving your car a new lease of life? We can transform your car to an immaculate showroom condition too! For the blog of the week, our showcase is on the most sophisticated MINI ever built. 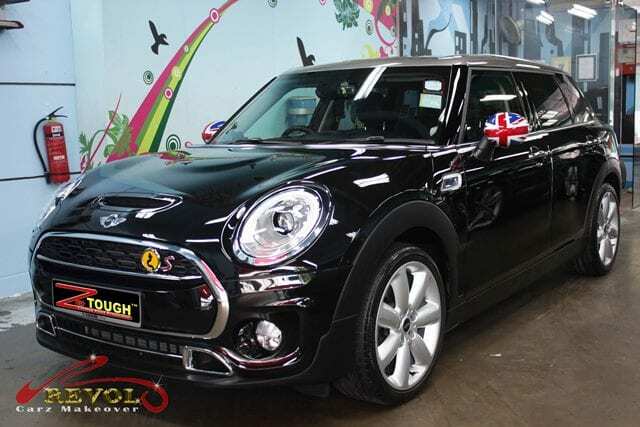 Say hello the 5-door Mini Cooper S Clubman. At Revol Carz Makeover, we injected a dose of excitement with ZeTough Ceramic Paint Protection treatment to add even more flair to the distinctive big MINI. The new 2016 MINI Cooper S Clubman is longer and wider than the predecessor. The bigger space accommodates five seats, extra rear legroom and a bigger boot with split barn doors. On the exterior, the striking front, side and rear spoilers complement the extended roofline and unique body contours. Mini icons such as the big round headlights, hexagonal grille and side scuttles highlight a funky twist and athletic stance. The Cooper S has a fresh 2-litre four-cylinder turbo engine, producing 189bhp and 206 lb/ft of torque boasting an exhilarating 0-100km/h acceleration in 7.4 seconds and a top speed of 225 km/h. Marvel at the following photos showing breathtaking results of Revol’s professional grooming with ZeTough Ceramic Paint Protection treatment. The most sophisticated Mini ever built. 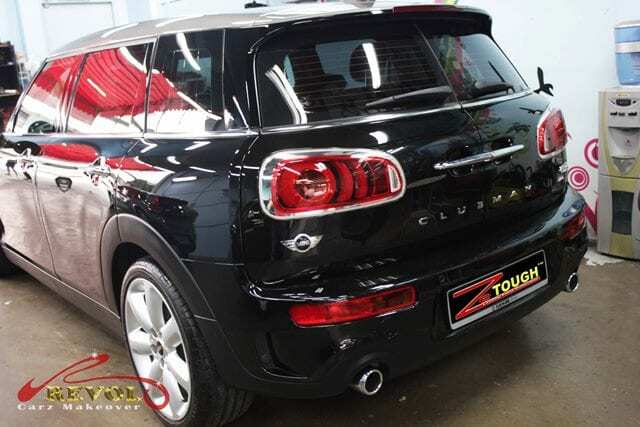 The Mini Clubman Cooper S is treated with the long last ZeTough Ceramic Paint Protection. The iconic large round headlights, hexagonal grille and side scuttles highlight a funky twist and athletic stance. 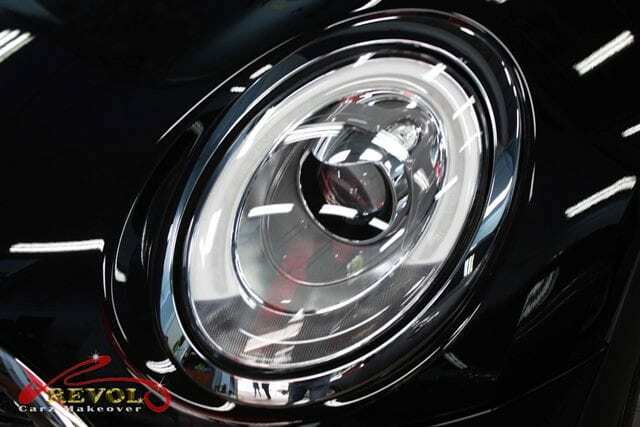 The iconic big round LED headlights are like sparkling jewels after rigorously polishing. We pay close attention when detailing to achieve an absolute cleaned interior surfaces. An 8.8 inch touch screen is seated at the heart of the MINI Centre Instrument. 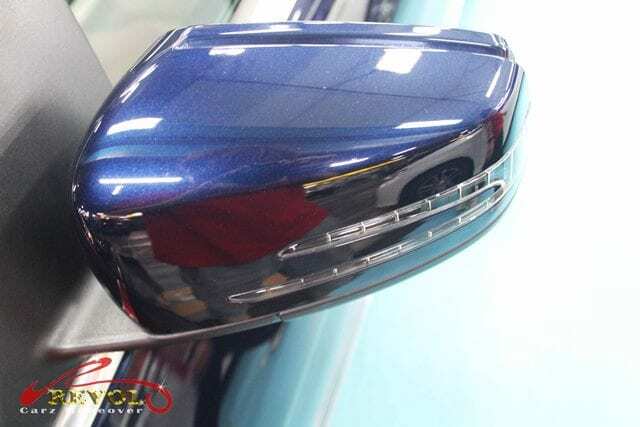 The “Union-Jack” wing mirrors pay tribute to the iconic MINI. We honor the flag with a deeper and lasting shine and protection. The split barn-doors at the rear are now sporting the largest tail-lights mounted on the doors. 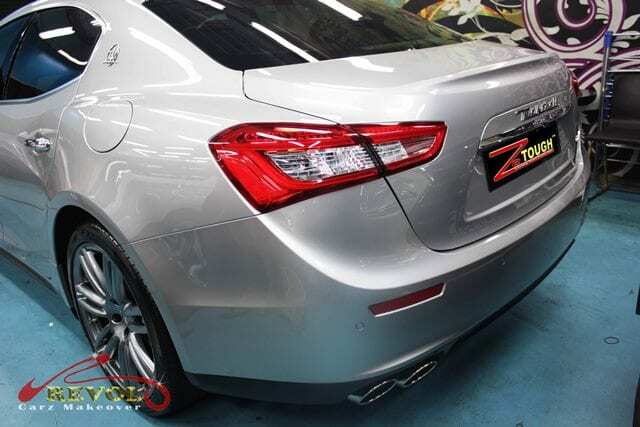 The rear view is more breathtaking with the coat of ZeTough Ceramic Paint Protection. The 2016 Mini Cooper Clubman S with its 6-door glory. We never overlook giving the chromed tail pipes an intense polish. 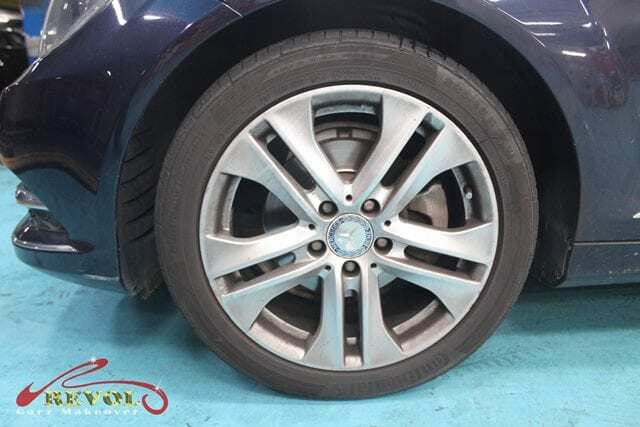 We brought the 18” spoke alloy wheels back to life with several steps of cleaning and polishing. Yes, we can certainly transform your ride to an incredible showroom condition too with our professional grooming with the proven ZeTough Ceramic Paint Protection. ZeTough Ceramic Paint Protection guarantees your car’s paintwork gets extreme protection with showroom shine throughout your ownership. Maintenance after the treatment is minimal. You enjoy a long-term peace of mind.